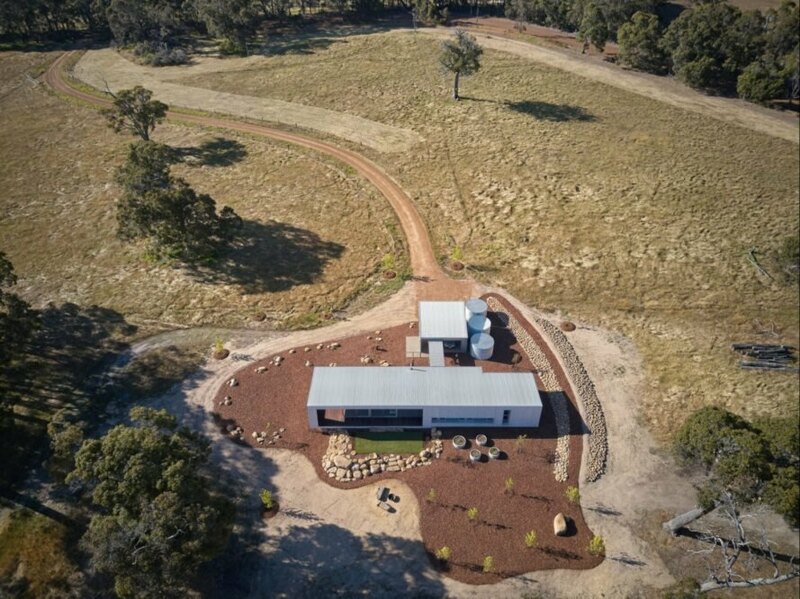 While it may not exactly be the Little House on the Prairie, Osmington-based Archterra Architects certainly made the most of a beautiful plot of grassland in Western Australia. 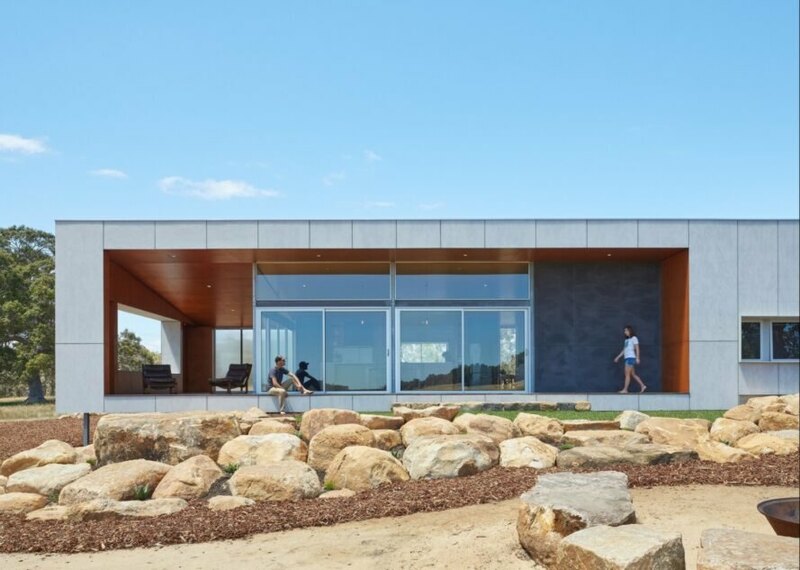 The architects have unveiled the gorgeous 2,000-square-foot Paddock House that uses solar power, natural materials and several passive features to blend the home into its natural landscape while reducing the residents’ water and energy use. 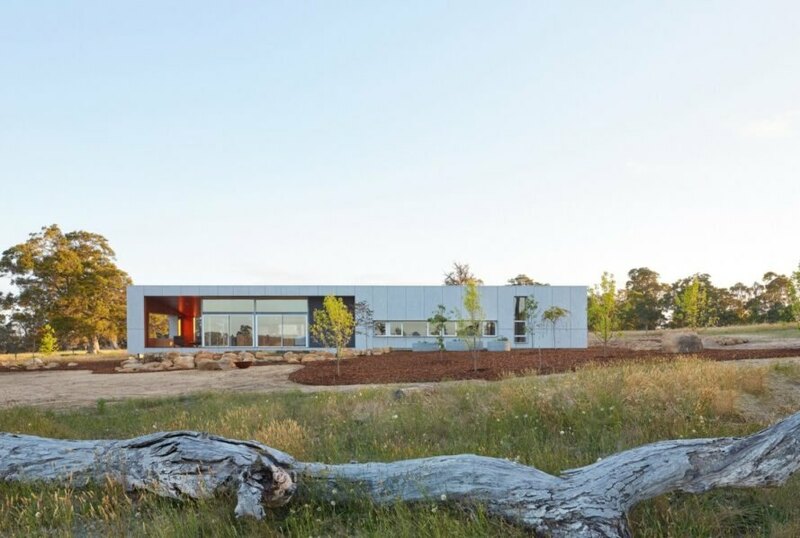 Located on an expansive field of rye grass in Margaret River, Western Australia, the home was strategically designed to have a strong connection to its natural surroundings. Oriented to the north to take advantage of sunlight, the main rectangular volume features a series of all-glass facades and openings that provide stunning views as well as access to outdoor spaces to take in the fresh air. 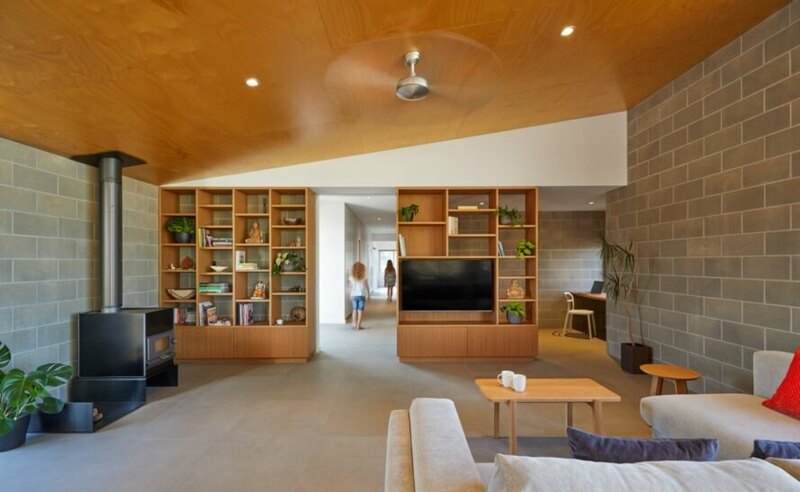 In addition to making the most out of its idyllic location, the design was also focused on using natural materials and passive design features to reduce the home’s ecological footprint. 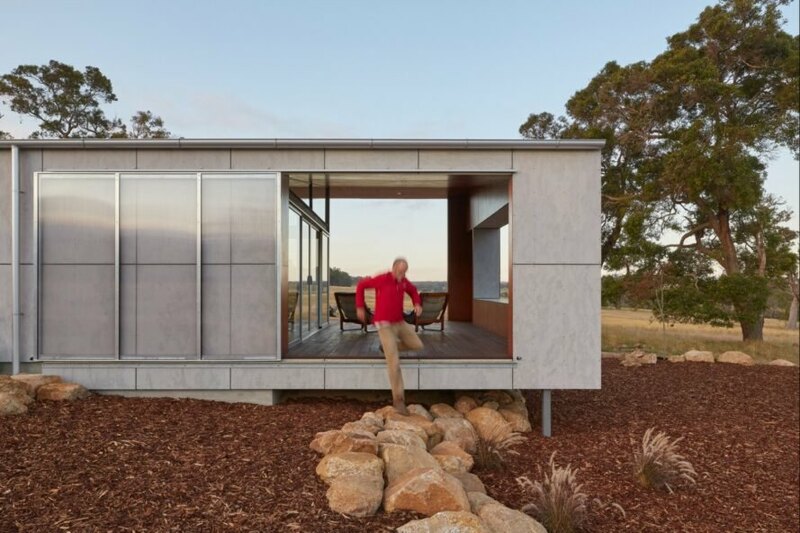 Starting with the materials, the exterior is clad in a skin of pre-sealed raw cement, which not only provides the home with a strong insulative envelope, but one that is also low maintenance. To contrast the bright exterior, the external areas that wrap around the home were lined in a warm toned plywood, which was also used throughout the interior living spaces as a lighter tone. In fact, plywood and concrete feature prominently throughout the home, with sleek concrete blocks used to create walls and plywood used for the ceilings and additional furnishings. The light concrete blended with the warm wood gives the home a contemporary-yet-cozy, cabin-like atmosphere. Along with an abundance of natural materials, the home was equipped with several passive measures, such as its northern orientation, which brings in optimal natural light and creates a system of efficient cross ventilation during the hot summer months. 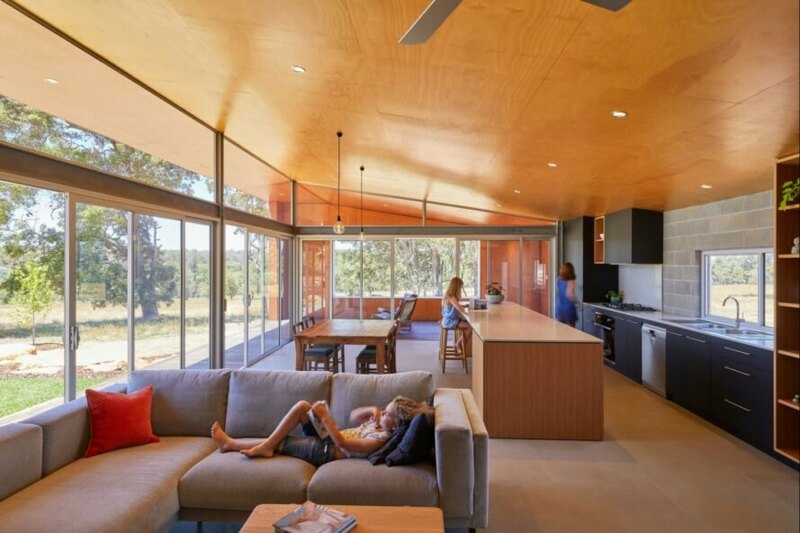 Additionally cooling the interior is the overhanging eaves that jut out over the sides of the house, providing shading to the interior and exterior areas. The home runs on a 4.5kW solar array that generates sufficient energy for the family’s needs. Energy loss is further minimized through concrete floor slabs and insulated cement blockwork walls that provide a strong thermal mass. To conserve water, the home was also built with a gray water recycling system. 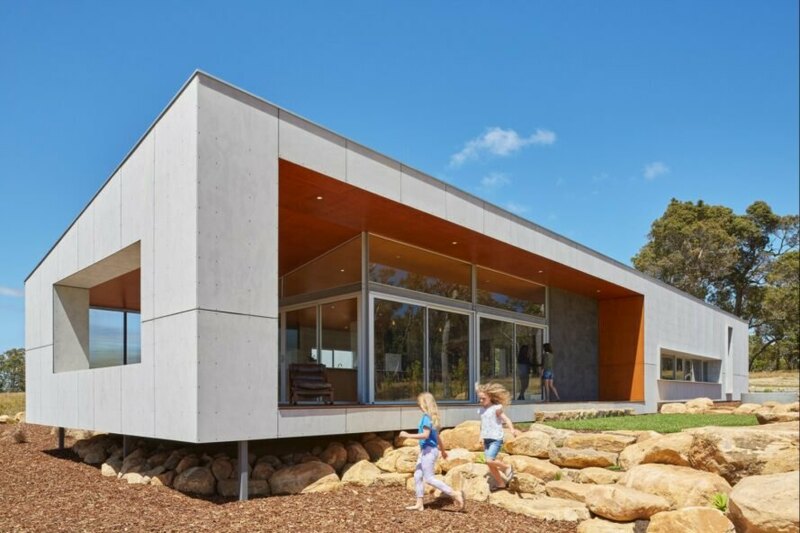 Osmington-based Archterra Architects designed the Paddock House for a family. 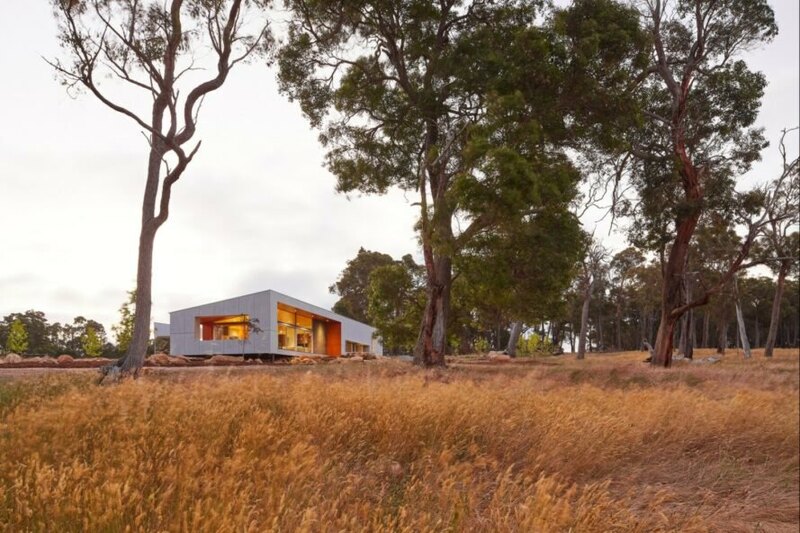 Located in Margaret River, Australia, the home sits on a a field of rye grass. A glazed facade is covered with a block frame, providing shade from the summer sun. The home is almost 2,000 square feet spread over a low-lying volume. The home design was blended into the natural landscape. The home was built with plenty of connected outdoor spaces. 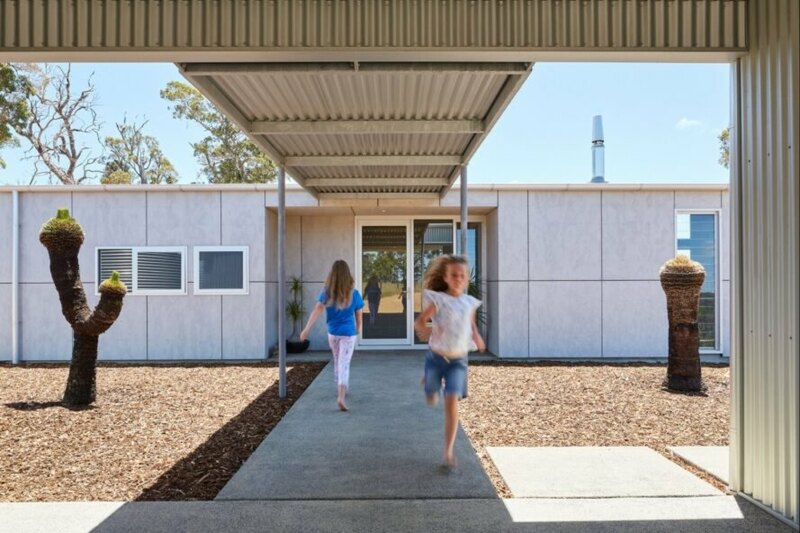 The glazed facade allows the family to take in the views of the grazing cattle and kangaroos. Inside, natural materials were used to create a modern but nature-based design. The interior design is both minimalist and inviting. 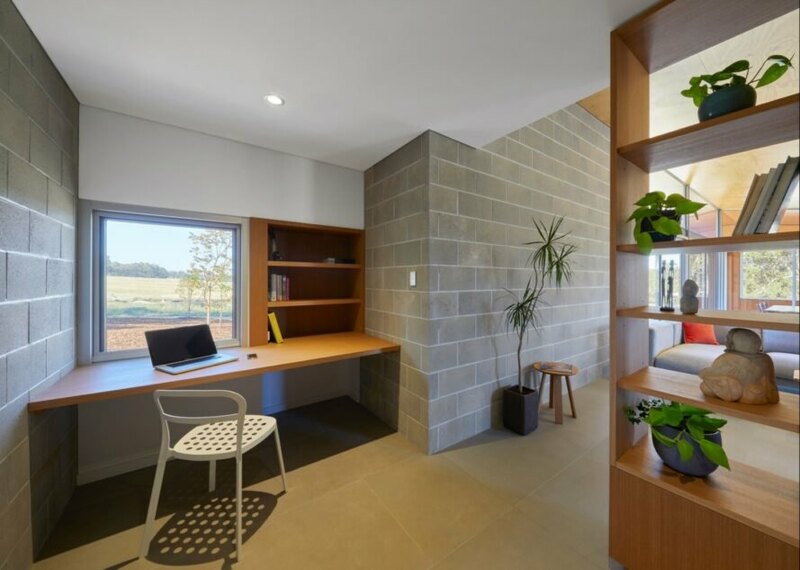 Walls constructed of concrete block feature prominently in the home. Plywood ceilings and concrete walls result in a vibrant atmosphere. Plywood was used for many of the furnishings. Most of the common rooms are minimalist in nature. The main volume of the home is a rectangular form with a covered walkway that wraps around one corner. The home is equipped with a gray water recycling system. The contemporary nature of the residence blended with its natural materials give the home a unique character. The home was oriented to the north to take advantage of natural light. The house shares a 4.5kW solar array with another home on the lot.